You are currently browsing the archive for the Flower Shows category. 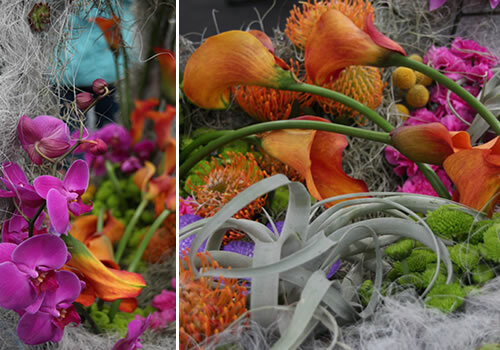 Sunshine may have been in short supply last week, but the floral marquee at Southport Flower show had a floral display brighter than the sun. 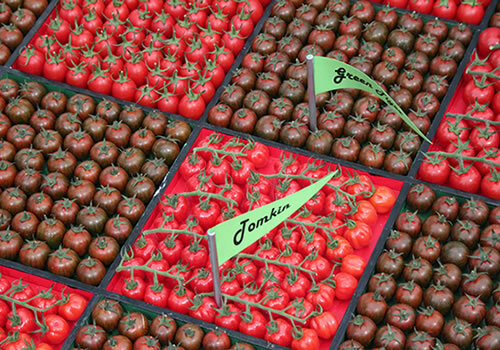 The impressive display won a gold medal at Southport Flower Show and was very popular with visitors. 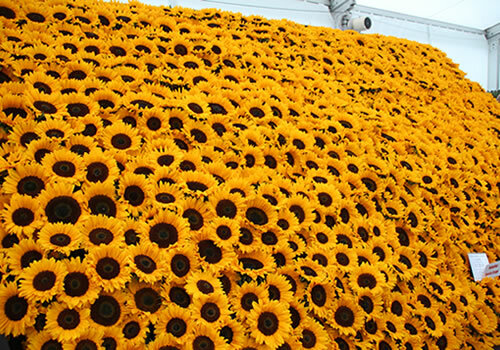 Poplar Farm Flowers from Ormskirk, raised hundreds of pounds for charity with their sunflower wall. 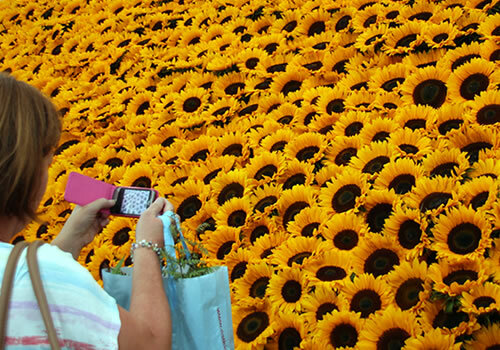 Visitors paid 50p each to guess how many flowers were in the display. The money raised was donated to Queenscourt Hospice in Southport. I’ve wrote a couple of articles on Southport Flower Show in the past few days. Today’s is all about the Show Gardens. The garden above is by Greg Mook of Mook Gardens, they named it Keep Cool & Carry On. It was awarded a Large Gold Medal. 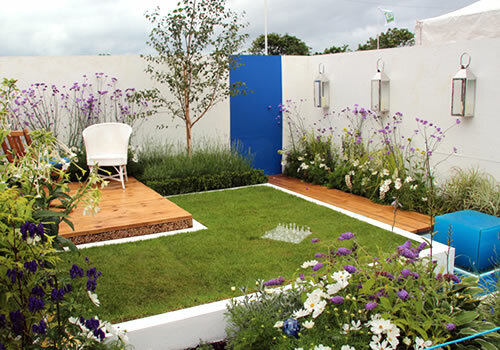 The theme for year was ‘cool’, the garden reflected the theme in the colours of the planting. They used plants in blues mixed with black foliage plants. 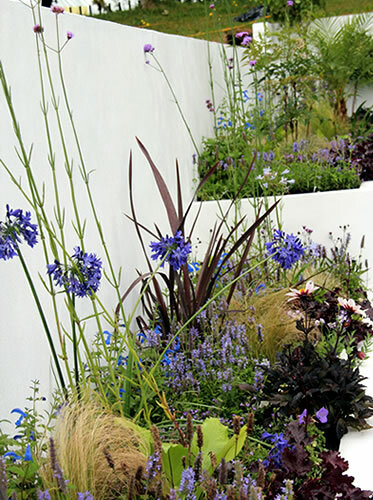 The tall verbenas and agapanthus looked great set against the white walls of the garden. This garden by Crosby Landscapes featured a cool pink and white theme with clipped box trees. A waterfall in the corner flowed into a pool which ran through the garden, stepping stones crossed the water to reach the seating area. The garden won a Large Gold Medal. This garden featured Verbena bonariensis as well, it was popular at Southport this year, as it was at Tatton Flower Show. The designers verbena around the walls of the garden. 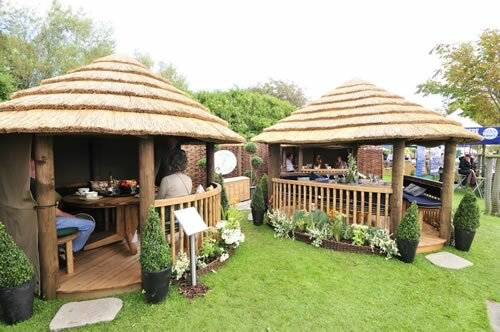 Myerscough College were awarded a Large Gold Medal for their design. 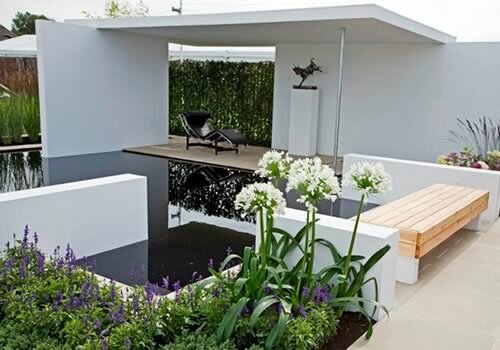 The garden was named Personal Serenity, the cool shades of lilac, purple and white created a very tranquil space. 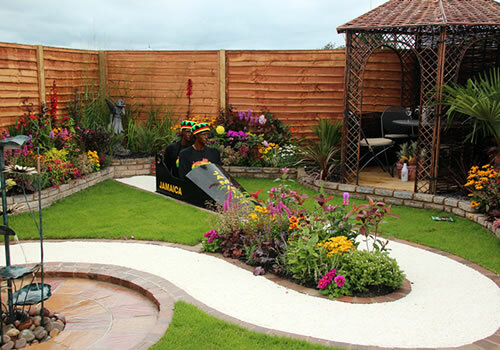 The Cool Runnings garden is by Brian Caunce Paving. It won a Large Gold Medal and was based around the Jamaican bob sled team. The central path reflects the bob sled track winding through the garden. 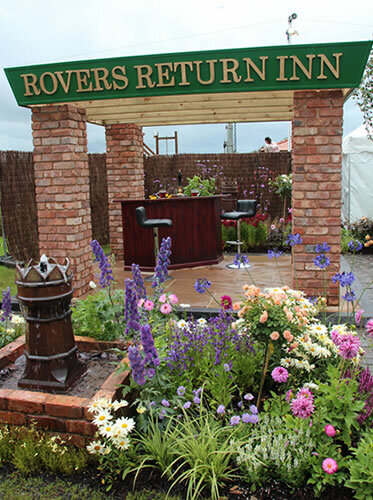 The Coronation Street garden was commissioned by Southport Flower Show to celebrate Coronation Street’s trip to the seaside. It features the famous chimney pots from the street, the bar from The Rovers Return Pub and street sign. 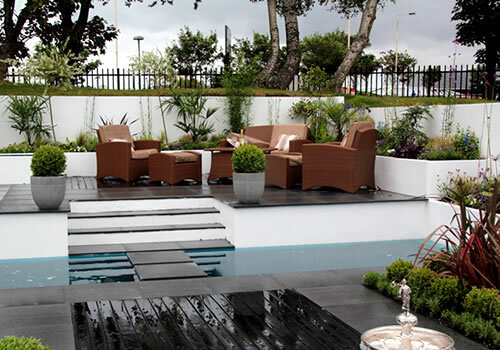 A chill out area was provided with a comfy sofa which was surrounded by planted beds and traditional red brick walls. I enjoyed a grand day out at Victoria Park yesterday, despite the damp weather. A bit of drizzle didn’t put off visitors, the show was very busy. 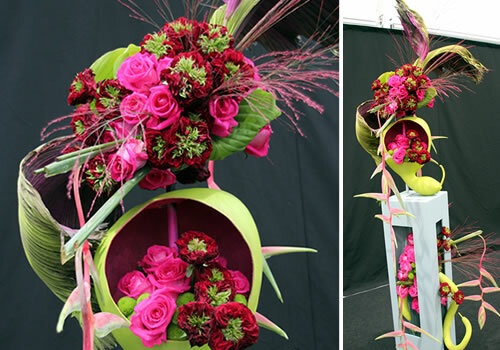 Last week I featured an article about what you could expect at Southport Flower Show. Today’s article has a few snippets from what I saw at the show. Over the next few days I’ll feature some more articles on the show gardens and floral designs. Visitors queued up to have their photo taken with a pint at the Rovers Return, in the Coronation Street garden. The garden includes features the famous street sign, the bar and chimney pots. 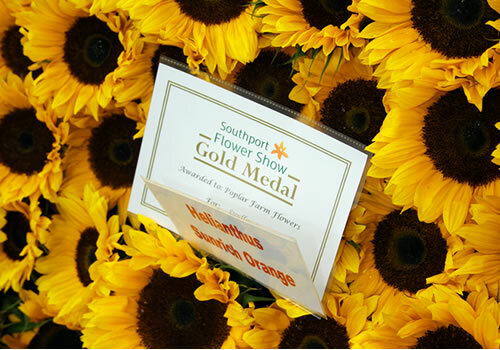 Southport Flower Show has the largest amateur growers competition in the country. Competitors bring their home grown flowers, plants and vegetables, all keen to be crowned the best in their chosen category. 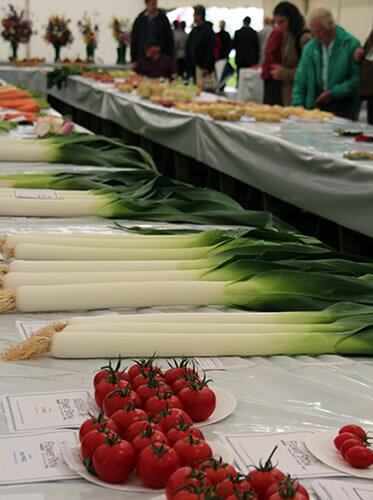 There were some beautiful examples, grown by talented amateur growers, including the biggest leeks I’ve ever seen! Visitors were entertained with bird of prey displays, medieval knights and live music throughout the day. I took a break from plants and flowers to watch The Knights of the Damned display of ye olde English jousting. The Grand Floral Marquee contained displays from 66 exhibitors. The marquee showcases everything from cottage garden flowers to Bonsai trees, all grown by specialists. Visitors can get expert advice and buy plants and seeds direct from the growers. Tomorrow (Sunday 19th August) is the last day of the show, it’s open 10am till 5pm. If you’ve not got tickets, you can buy them on the door for £21, concession tickets are £18. Kids under 16 get free entry when accompanied by an adult. 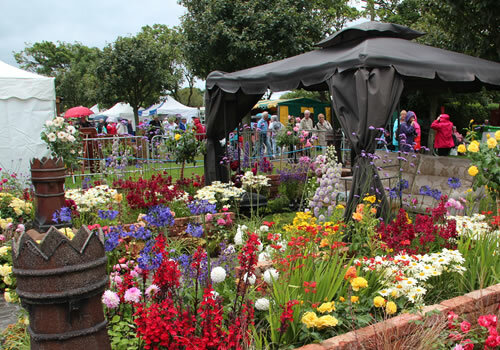 Southport Flower Show starts next week, from 16th to 19th August in Victoria Park, Southport. 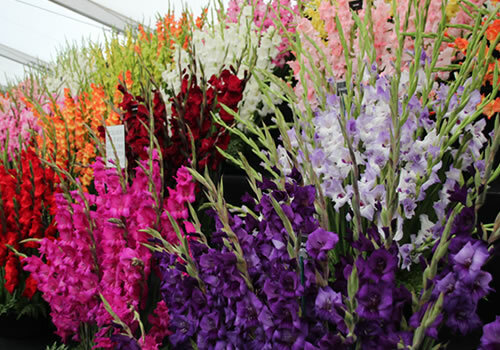 It’s the largest independant flower show and this is it’s 83rd year. 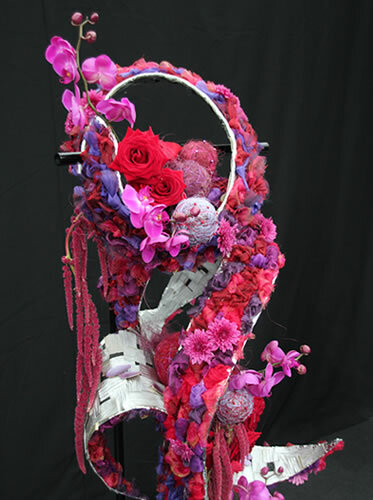 The official theme is ‘Cool’, gardeners and growers will be reflecting the theme in their designs. 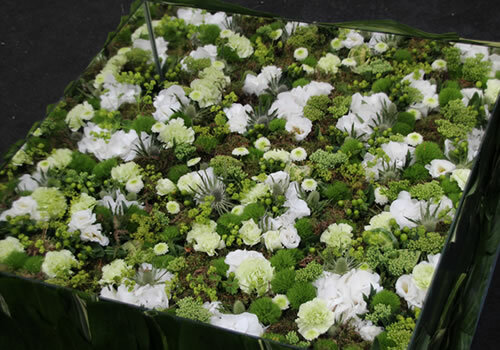 Visitors will see inspiring show gardens, exciting floral design and exquisite flower exhibits. A new feature for this year is the Edible Gardening Festival, which aims to inspire us all to grow our own fruit and vegetables. 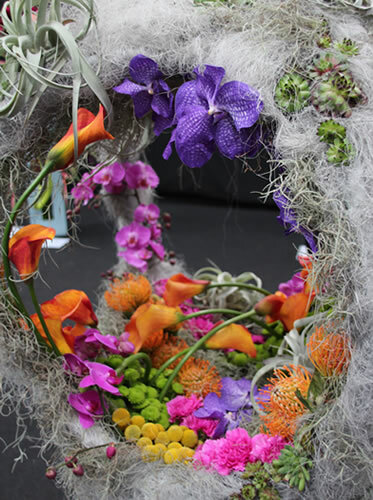 The show features one of the largest amateur growing competitions and floral art competitions open to everyone. A host of famous faces will be at the show including Professor David Bellamy, Simon Rimmer, Alys Fowler, Sir Roddy Llewellyn, and Christine Walkden. 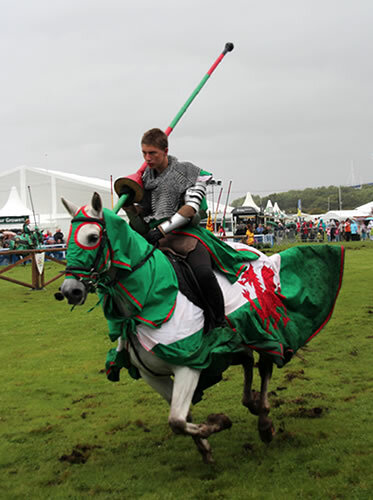 There is live music and entertainment throughout the week including The Knights of the Damned jousting display and Ben Potter’s Hawk experience. 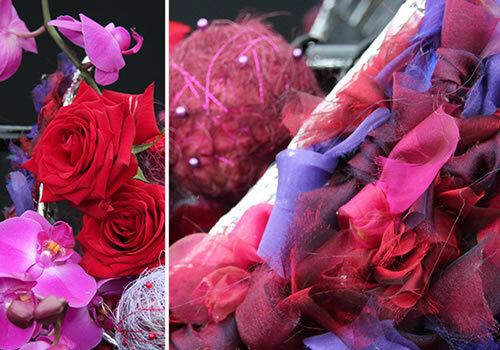 The Floral Arts Marquee will be running demonstrations throughout the week. For the first time the show will also include The Northwest Food festival and the Northwest Book Festival. 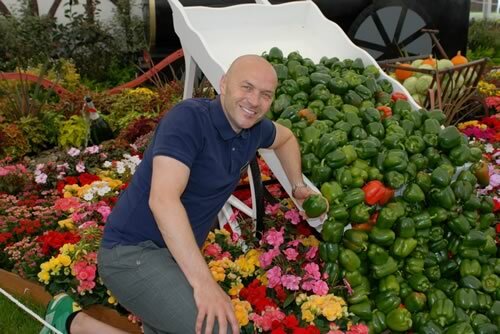 Simon Rimmer is the Food Festival’s patron and will be showing visitors how to make some of his favourite recipes in the cookery theatre on Saturday. 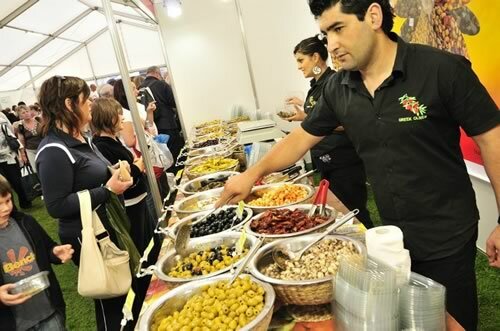 There will be gourmet treats to sample and lots of food and drink to buy. The book festival will feature authors from all genres, who will be reading their work, meeting fans and signing books. If you’ve not got your ticket yet, you can still buy them on the door for £21, £18 for concessions. Children under 16 can enter free of charge when accompanied by an adult.